The Office de Tourisme in Annecy can be a bit difficult to find, but it's helpful when you do find it. 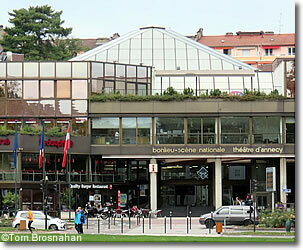 The Office de Tourisme du Lac d'Annecy is in in the modern Centre Bonlieu - Scène Nationale - Théâtre d'Annecy building complex at 1 rue Jean Jaurès near Avenue d'Albigny (map), 500 meters (547 yards, 8-minute walk) north of the Palais de l'Île. Walk around to the north side of the building (away from the lake) to see the signs to the Office de Tourisme, which are not prominent on the other sides of the building facing the Vieille Ville (west) and the lake (south). This is the building, but it can be difficult to find the Office de Tourisme at first.